THE TWO SIDES in the Irish Rail dispute held another marathon talks session into the early hours but a breakthrough is looking even more unlikely this morning. Discussions between management, Siptu and the NBRU at the Workplace Relations Commission went on until 3.15am. This morning National Rail and Bus Union general secretary Dermot O’Leary said it appears the Iarnród Eireann is “determined to prevent a resolution to the dispute ahead of tomorrow’s planned work stoppage”. Our appeal yesterday to the minister and the department to advise the company side to actually negotiate has, it would appear, fallen on deaf ears. Despite the best efforts of the Workplace Relations Commission it has become frustratingly clear to those of us on the trade union side that every genuine attempt by the parties at the talks to work towards a resolution is being stymied by forces within the company. Siptu organiser Paul Cullen was also critical of management, saying he was “furious” at the negotiations are being handled. The company representatives have engaged in what can only be described as satellite negotiations in these talks and appear to have been restrained from reaching any meaningful solution . If the discussions continue along these lines it seems inevitable that industrial action will proceed on Friday. Drivers are due to stage rush hour stoppages from 6am to 9am tomorrow (ahead of the bank holiday weekend) and again on Friday 6 November. Iarnród Eireann spokesperson Barry Kenny told RTÉ’s Morning Ireland today that that progress has been slow. We do feel there is a route to a resolution that would meet the goal of ensuring there was benefit there that could be shared between the company and the drivers. Talks will recommenced at 11.30am today in a final effort to avert industrial action. “Due to the notice of industrial action, Iarnród Éireann cannot currently guarantee services across DART, Commuter and Intercity on the mornings of 23 October and 6 November, and we apologise to customers for the inconvenience caused,” the company said in a statement earlier. 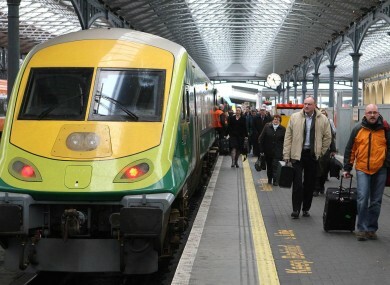 Updated service information will be available on www.irishrail.ie. Email “Breakthrough in rail dispute unlikely as unions hit out at management”. Feedback on “Breakthrough in rail dispute unlikely as unions hit out at management”.